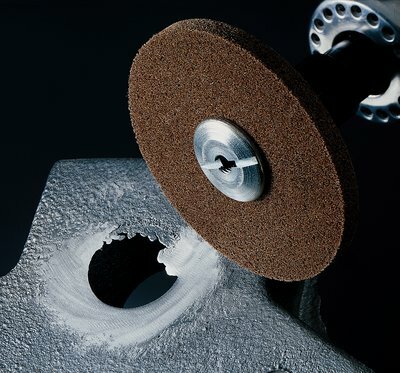 Our Scotch-Brite™ Roloc™ Cut and Polish Unitized Wheel is a dense, hard wheel ideal for aggressive deburring, blending, and finishing applications on harder metals and for applications where portability is needed. Our wheel with Roloc quick-change attachment provides an excellent starting point for jobs requiring the availability of small diameters and narrow widths. 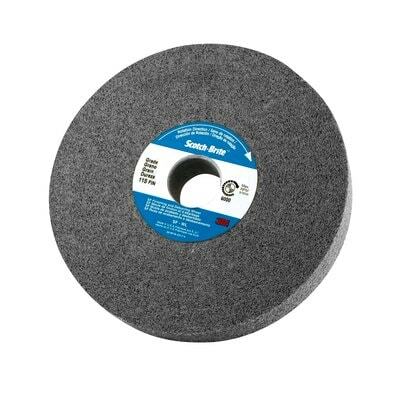 Use the Scotch-Brite™ Roloc™ Cut and Polish Unitized Wheel to replace many conventional abrasive products such as rubber bonded wheels and small set-up wheels. It provides a consistent finish without cutting into the workpiece, reducing or even eliminating intermediate steps. Constructed with aluminum oxide mineral coated on a tough nylon web, this versatile wheel is well-suited for use on harder metals like stainless steel, carbon steel, and high nickel alloys. For added productivity, our wheels feature a Roloc™ threaded attachment that provides easy changeouts between steps on portable tools. The Roloc system allows for the use of both the edge and surface of the wheel without interruption of mounting hardware. 3M™ Roloc™ TR quick change discs are smaller discs that have a plastic threaded button or screw designed to easily and quickly screw onto a Roloc™ TR disc pad (sold separately) so that operators can easily change discs with a simple twist-off, twist-on motion. The Roloc TR system provides a secure attachment even for heavy-duty applications, and the variety of available 3M Roloc discs allows swapping from one application to the next in seconds. 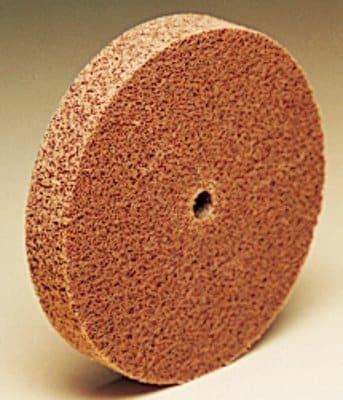 We designed Scotch-Brite™ industrial abrasives as unique surface conditioning products with abrasives incorporated into non-woven nylon or synthetic fibers. Combining abrasives with the fibers creates an abrasive system that delivers consistent results for the life of the product. The open-web material runs cool and is load resistant, which keeps the abrasive minerals cutting at high performance by limiting clogging of the fibers.